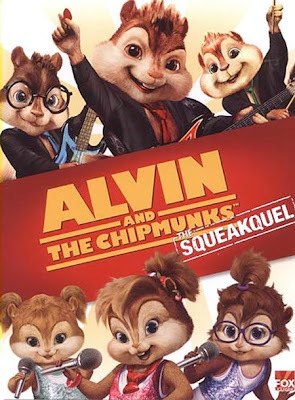 Stevee's key tip to surviving Alvin and the Chipmunks: The Squeakquel (2009) if you are over twelve years old: put yourself in the mind-set of a six year old and you will enjoy it! As soon as you go back to being yourself, then you might not enjoy it so much. You might think it is a little...silly. Alvin and the Chipmunks are a superstar group of singing chipmunks, who are the hottest group on the market. However, they start high school (yes, chipmunks at High School) to try and get even more famous. Their world is turned upside down when a group of female singing chipmunks, called 'The Chipettes', come to their high school, and are set to battle them to the top of super-singing-stardom. As I said at the start of the review, anybody with under twelve years old will enjoy this. So I am not going to take a very critical view on this movie, but I will say the thngs that are good about it: it is pretty fun, really cute and makes you quite happy. Now I will say the one major downfall: it's heavy reliance on slapstick comedy. There is only so much falling over and getting beaten around one person can take! To give this film a rating is near impossible, but if I were a lot younger than I am, I'd rate it 8/10. But because I couldn't really handle 88 minutes of reeeeeeeeeally high chipmunk voices berating my ears, I'll have to give it a 4/10. It's still really entertaining though!